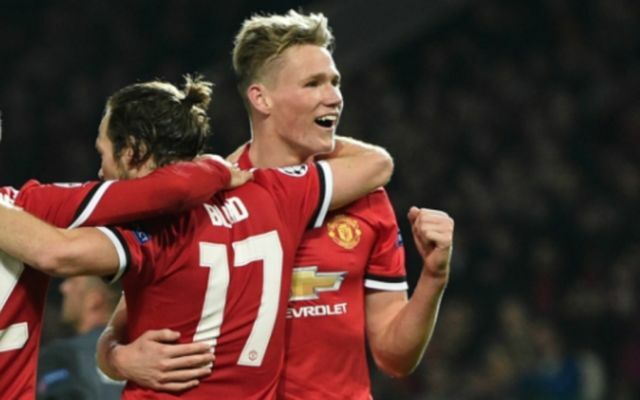 Manchester United starlet Scott McTominay has picked out two academy players who could be set to follow him from the youth team into the senior side in the near future. The 21-year-old looks a top talent after seeing increased playing time in United’s midfield this season, despite plenty of big-name competition from the likes of Paul Pogba, Nemanja Matic and Ander Herrera. McTominay is the latest in a long line of homegrown Red Devils youngsters to step up into the first-team, with Marcus Rashford and Jesse Lingard also among recent examples, while Sir Alex Ferguson’s greatest sides were built around the likes of Ryan Giggs and Paul Scholes who rose from the academy to become some of the best players in the world. It’s fair to say United fans take their history of blooding youth very seriously, and will be excited to hear McTominay offer an insight into who could be the next to make their breakthrough at Old Trafford. Speaking to HCL Technologies in a video on their Twitter page, McTominay name dropped Tahith Chong and Angel Gomes as players to look out. ‘There’s a number of different boys in the younger ages groups,’ he said.